Keeping underground tube stations cool is a significant engineering challenge, and one that costs London Underground Limited millions of pounds a year. Finding more cost-effective and environmentally friendly ways of keeping passengers safe and comfortable is an important challenge to overcome. Many systems require extensive rebuilding works and are prohibitively expensive to install and run. With that in mind, they turned to a team of LSBU researchers to see if there were ways to cool underground stations in a more energy efficient way. Led by Professor Graham Maidment of the Centre for Air Conditioning and Refrigeration, the team brought its considerable expertise to the challenge. The research team looked into using low-carbon ground source geothermal cooling to reduce the temperature of underground stations, developing novel cooling methods with genuine potential. In particular, they made use of existing infrastructures, keeping costs down and minimising the amount of disruption that would be needed to install them. Many underground stations are below the water table and need to constantly pump water out to avoid being flooded. LSBU's ingenious proposal was to transfer the heat from the air into water already being pumped out of the station. The newly-cooled air could then be circulated back into the station to lower the temperature, as warmed water was discharged into the sewer system. Excited at the potential implications of the research, LSBU then entered into a Knowledge Transfer Partnership with Parsons Brinkerhoff to evaluate these cooling models. Parsons Brinkerhoff is a global consulting firm that helps public and private clients plan, develop, design, construct, operate and maintain critical infrastructures. Further funding was provided by an Engineering and Physical Sciences Research Council Doctoral Training Account studentship. Working together, LSBU and Parsons Brinkerhoff designed and developed a pilot cooling scheme that was installed at Victoria Station in August 2007. The pilot was an overwhelming success. It confirmed that the premise was viable, lowering the platform temperature by 3°C and improving thermal comfort. The low-carbon, environmentally sound, cost-effective technology was also proven to be three times more energy efficient than a traditional air-cooled chiller system. 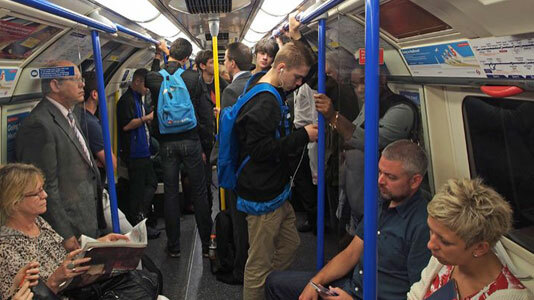 As a result, London Underground Limited has incorporated LSBU's cooling concept into its £500 million plans for the Victoria Line upgrade. Most of its current cooling installations are based on the cooling concepts proposed by the research, and a similar scheme at Green Park Station has already been recognised for its environmental impact. It won an Environmental Innovation award (sponsored by Eurostar) at the 2012 Rail Business awards, while the research behind the scheme won a Carbon Trust Innovation Award. The Mayor of London, Boris Johnson, was full of praise for the research too, describing the "innovative measures" adopted by LSBU as "a welcome weapon in our fight to keep passengers fresh." The technology has also been used in the Oxford Circus installation. Like Green Park, it reduces the station's carbon footprint as well as providing a more comfortable, lower cost and more efficient travelling experience for passengers. Unsurprisingly, LSBU's research has attracted worldwide interest. The Naples Metro has applied the method already, and a number of other underground operators are considering its use. These include metros in New York, Vienna, Glasgow, Beijing and Ontario. However, the story doesn't end there. Further research undertaken by LSBU alongside Parsons Brinkerhoff showed that the waste thermal energy could also provide heating for local buildings. This offers further carbon savings, with a typical London Underground mechanical ventilation shaft producing heat energy at half the carbon cost of a condensing gas boiler and a sixth of the system energy requirements. The commercial prospects of this benefit are currently being investigated by London Underground Limited and could well help bring further financial and environmental benefits to the city. Read more about LSBU's work in the field of Air conditioning and refrigeration.